This morning’s game drive was amazing. We left the Lodge with the intention to track a herd of Buffalo. 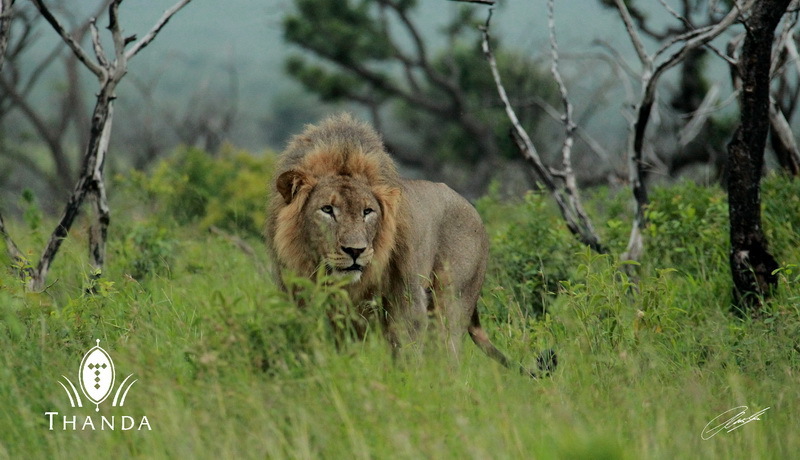 But on the way out we decided to have another quick look at our dominate male Lion and the oldest female of the South Pride (“Grandma”), who we saw the previous evening on top of hill. 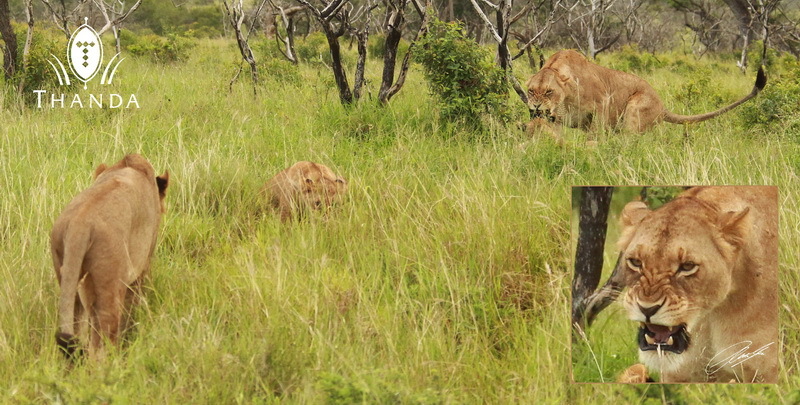 When we arrived there we met eight Lions – three Sub-Adults (“Uncles” and “Aunt”) and a young Lioness (“Mum” with her two – eight month old – cubs (“Boy” and “Girl”), the Thanda Dominate Male and “Grandma”. This was the complete South pride. Over the next three hours we observed family life and family drama. 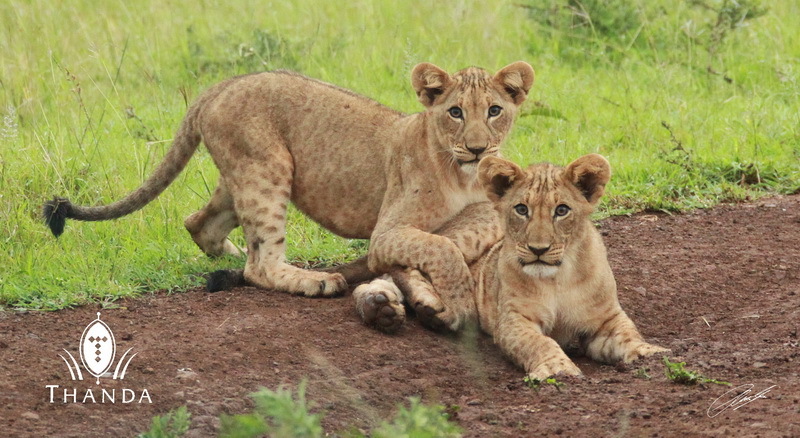 “Mum” had kept away the cubs from the rest of the pride for a long time. It was clear after a few minutes that the Thanda Dominate Male had accepted these cubs as his own, but “Mum” would not allow any of the “Uncles” and the “Aunt” near the cubs. 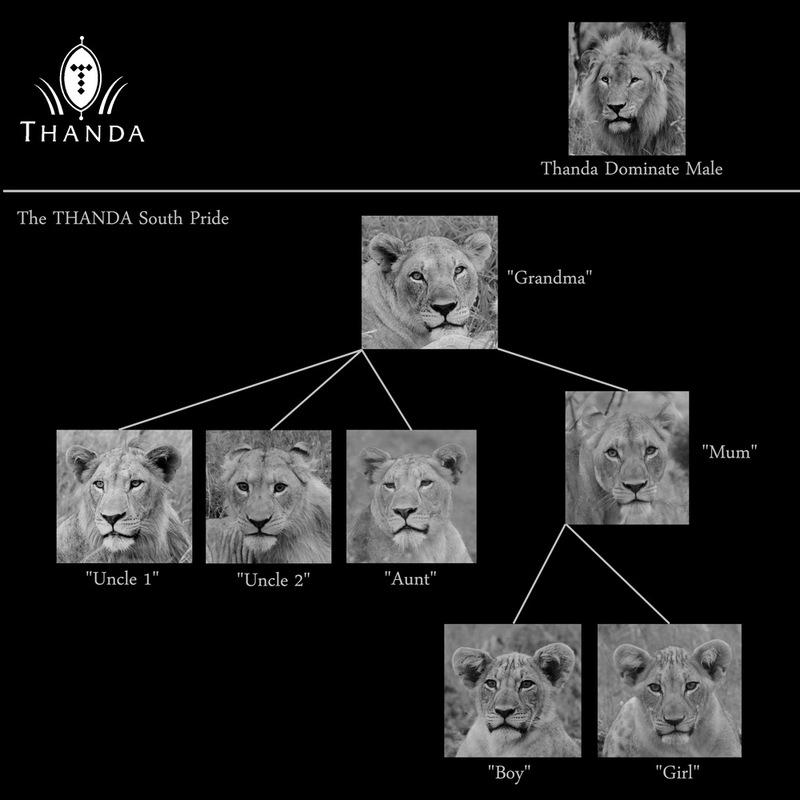 (Note: The cubs were fathered by a male that is no longer on Thanda). 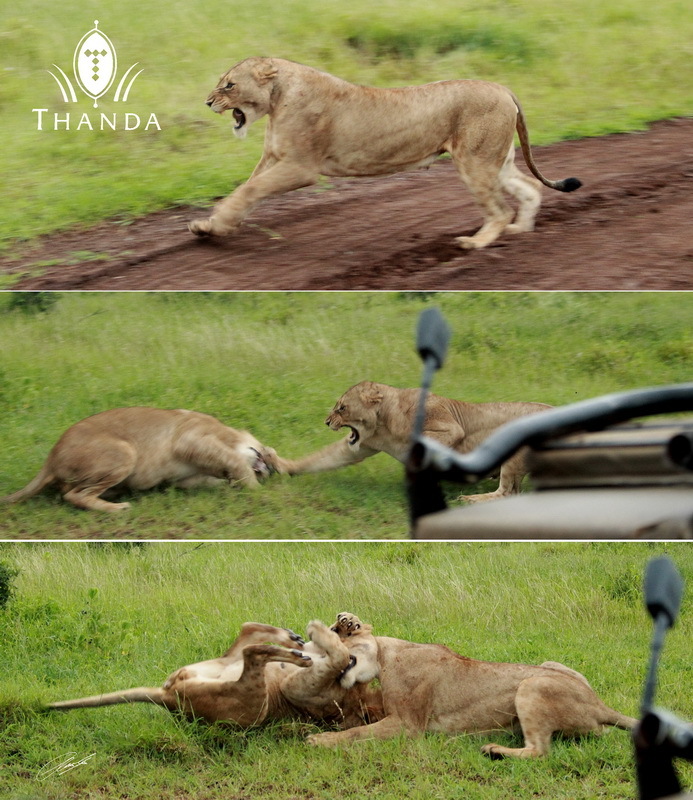 Every time one of the “Uncles” approached “Mum” became very aggressive and the Thanda Dominate Male joined her in defense of the cubs. “Grandma” sided with the three sub-adults and was also quite aggressive towards her grand-kids. 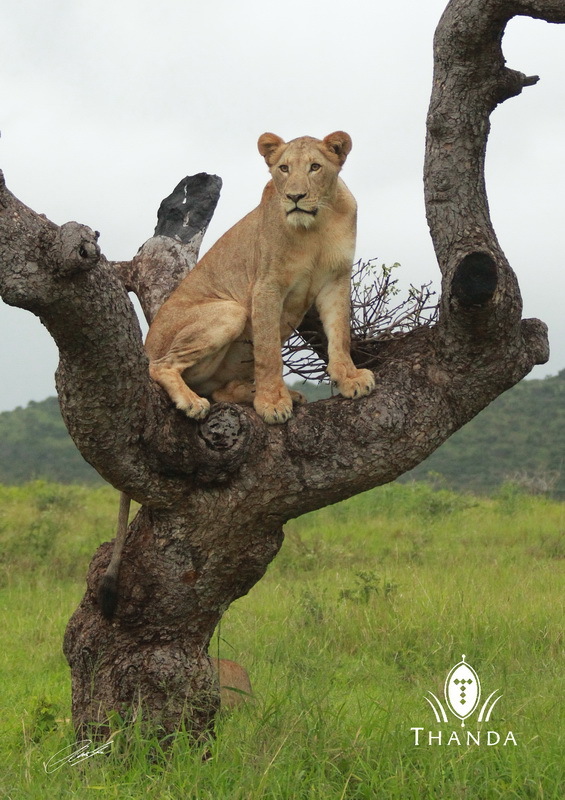 We observed “Mum” fighting for her cubs, the cubs playing, the “Aunt” climbing a tree, one of the “Uncles” mating with the “Aunt” (when the big male was not watching), all of them growling a lot at each other and the “Uncles” and “Aunt” in an attempt to hunt for Impala. I hope you enjoy this picture documentary! PS: I have a included a “family chart” to make it easier to understand the relationships. “Mum” disciplining her younger brother “Uncle 2”, who tried to get to close to her cubs. 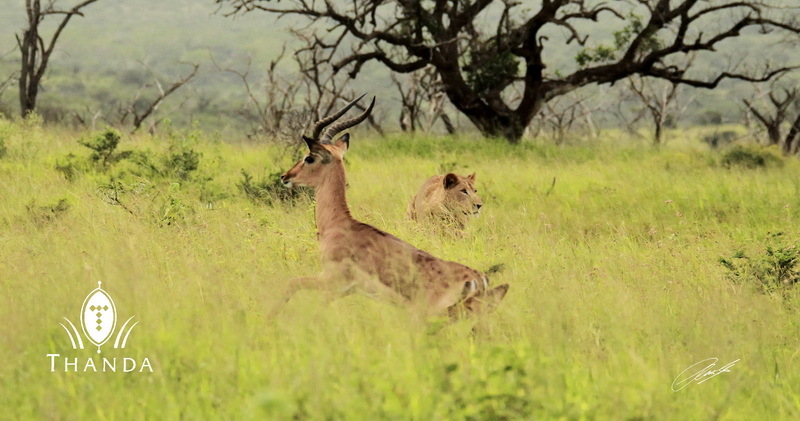 The Thanda Dominate Male was watching the family drama from a distance. The two cubs were playing while the adults were arguing about them! The “Aunt” was observing the scene from a nearby tree. Wow, Christian, you captured the entire “circle of life” in one day! Those shots are amazing, and thank you for sharing. I love following your adventures. Thank you so much for sharing a portion of your adventures with us on the web! I look forward every day to your notes, and today’s was special! Thanks. Thanks, also. A very exciting presentation for those of us not present. Wow, that was a very exciting photo documentary! Mom sure was angry! The cubs were cute wondering, huh? Thank you for sharing. The family chart is fantastic…I imagine you have them for all your various families and hope you will share more of them with us. Interesting to see how different they look when you put them side by side like that. Sure wish I had been there on this very special day. 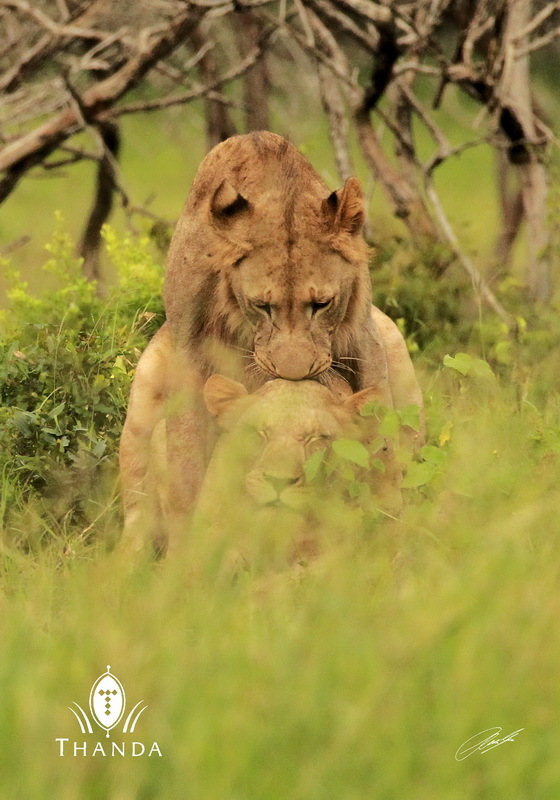 Unusual for a dominant male lion to protect anothers young. I’ve heard they usually kill them. Looks like you had another hard day at work!! :-). This is a wonderful series of pictures with a great presentation of the events of the day of the Lions. It would have been nice to have been there. Thanks for sharing. I’ve thought about this several times today. It’s amazing! I came back to your blog and re-read it and looked at the photos again! What an exciting 3 hours! The photo at the bottom of your post “Mum” getting upset again, wow she was packing some heat, huh? Gives me goosebumps! I bet at some point Mum must have been exhausted. Thanks for all the photos and the chart! In the image of the aunt watching from a tree who is hiding behind the tree? Thanks for sharing your journey. Fantastic! It’s great to see a day in the life of the pride of lions! Thank you for sharing! Thanks for your question/comment (granny1940) – It was one of the “uncles” behind the tree (her brother).